this fragmentation, focusing on key institutions – whether these are hospital groups, pharmacy chains or even large public and private payers – and for those pharma companies doing it well, it is producing measurable business benefits. What about those institutions that cross national borders? Recent years have seen the formation of ever-larger providers – super accounts – that do exactly this. We have seen the rise of multi-country hospital chains, such as Australian company Ramsay Healthcare, which also provides private healthcare in the UK, France, Indonesia and Malaysia. The Fresenius Helios hospital group, based in Germany, recently acquired the Spanish hospital group Grupo Hospitalario Quirónsalud to become the largest hospital group in Europe. Similarly, there are major pharmacy chains expanding their businesses across markets, such as Walgreens Boots Alliance, which operates the largest global pharmaceutical wholesale and distribution network delivering to more than 230,000 pharmacies, hospitals and other customers in more than 20 countries. We are also seeing a rise in payer influence and control, often across multiple markets. So, how does a Key Account Manager (KAM) in one market approach this kind of super account? In an ideal world, pharma companies want their KAMs to act in a strategic role – to explore new opportunities, to uncover unmet needs and provide solutions, to build relationships and establish partnerships. But KAMs tend to operate on a local or at best regional or national level, and a KAM in one market can operate in a completely different way from a KAM in another market. There is a lack of aligned ‘vision’ within organisations around exactly what they want to be for these super accounts and insufficient coordination, so opportunities are being missed. Going forward, pharmaceutical companies have to create new processes for dealing with globalising accounts and position themselves as long-term partners by delivering value, thereby helping their customers to achieve their goals while driving sustainable growth and profitability. What do companies need to change? Succeeding in KAM transformation requires an external account-centric focus. Companies need to fully engage with a particular account, find out what is most important to them and align on common objectives. However, as reported previously, the largest hurdle to KAM excellence is probably change management driving true customer-centricity. Most pharmaceutical companies have focused their KAM programmes on product promotion through their internal customer-facing teams. Very few have transformed their business models towards long- term key account partnerships that truly engage cross-functional teams working closely together to deliver on specific account needs. It is a mindset shift that doesn’t always come easily. Leaders who have come through the ranks of pharma organisations with the traditional sales models can find it hard to let go of what has worked in the past. It requires a relinquishing of power from the centre, to trust and empower those with the account expertise to make strategic decisions. Cross-functional buy-in is essential – KAMs should tap into medical, marketing and market access, as well as sales – but again this is a mindset and process shift for teams used to working in silos. KAMs of super accounts should act almost as mini CEOs of those accounts; empowered and able to create quick wins directly with their specific key accounts by putting theoretical KAM concepts into practice immediately. 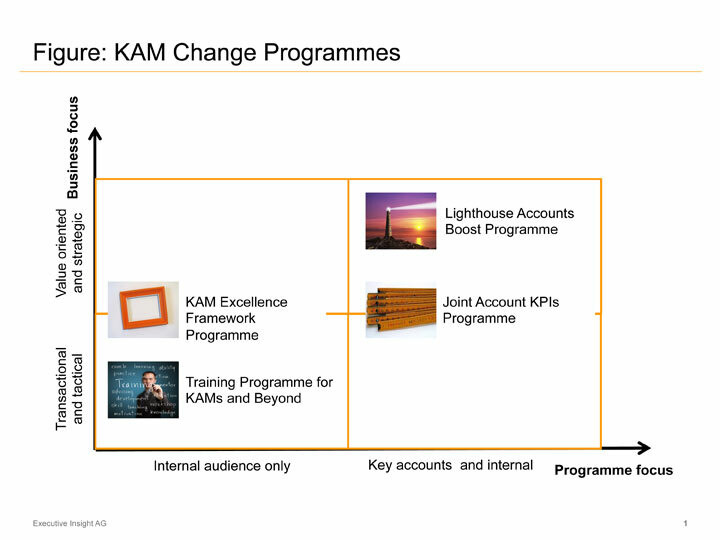 So, which KAM change programme should you implement? Pharmaceutical companies have applied different KAM change programmes, such as traditional KAM excellence programmes, training programmes for KAMs and joint account KPIs programmes. After a decade and more of experience with pharmaceutical KAM projects, we have developed a framework to segment the various KAM Change Programmes along two key dimensions (see KAM Change Programmes figure) – programme focus (internal and/ or key account) and business focus (transactional and tactical or value oriented and strategic). When starting a KAM project today with our pharmaceutical clients, we first discuss their key objectives before tailoring the project approach and methodology to their needs, building on our successful experience across the full spectrum of KAM Change Programmes. The cross-border super accounts qualify best for the Lighthouse Accounts Boost Programme category in the top right. What is a ‘Lighthouse Accounts Boost Programme’? It focuses on creating quick wins with a few selected large key accounts through value- oriented partnerships. This particular KAM Change Programme was designed to mobilise individual account teams and validate what was required to win with their specific account before scaling the programme further based on the initial insights. We recently worked on a programme with a global top 15 pharmaceutical company with a vast product portfolio and an imminent, crucial product launch. Importantly, there was a desire from the leadership to introduce disruptive change in its go-to-market approach. However, there was no clear direction on how to do this for KAM. We focused first on only one key ‘super account’ in four different countries. The major emphasis initially was on servicing the specific account needs, requiring significant preparation, research on account goals and challenges and potential collaboration solutions, and aligning cross- functional teams. and followed through systematically within the company, which also led to follow-up senior account executive meetings. Importantly, there was a huge change in mindset and overcoming internal preconceptions such as ‘accounts only want to talk about price’, ‘they only see us as a supplier’ and ‘there are no new opportunities for growth’. With a major transformation effort, the company overcame the internal presumptions and processes that could have held it back previously. With the relationship and goodwill established, and clear tangible outcomes after the initial meeting, the longer-term outcomes were significant – the company’s new product was listed at launch at a premium price, and year-on-year incremental account sales grew 10-15% overall. After the success of the first Lighthouse accounts, momentum grew, with country general managers and KAMs embarking proactively on the next wave of key accounts, demonstrating a positive impact on capability development. The consolidation of influence to several key ‘super accounts’ is likely to continue, with large healthcare institutions employing thousands of employees across many countries. Their true partnerships will be forged with companies able to help them in their ambitious journey. Pharmaceutical companies that enter into discussions with the needs of the institution as their first priority, and a willingness to change internal preconceptions and processes to accommodate this, will fare better. Indeed, the companies that move first can establish lasting relationships now and help to co- create a mutually beneficial future together. These first movers will learn more and more about their key accounts’ needs, making it difficult for other transactional product-focused pharma companies to compete successfully. Ultimately, account-centricity will enable these first movers to spot transformative value opportunities because they are able to overcome external and internal cynicism and build a meaningful relationship based on mutual trust. Kevin Simpson is a pharma industry expert on Key Account Management and related global change programmes, Aleksandar Ruzicic is Partner and Anthony Schläpfer is a Senior Consultant at specialist healthcare consultancy Executive Insight.